What can I tell you readers? I am so damn confused. Never in my life have I had such a tug-o-war with a book. Do I love it? Hate it? Why am I sobbing? And now I’m annoyed. 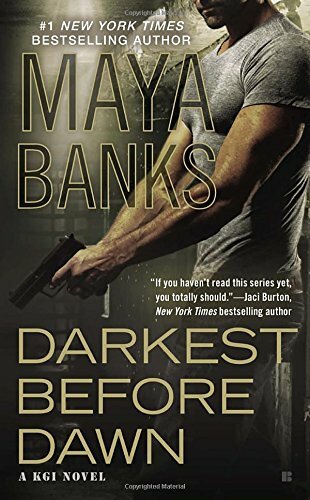 Number one: Maya Banks is a good writer. She is. Let’s just get it straight. That’s why I always raise my hand when THE DISH gets one of her books. But this book? I just wish I had read the entire KGI series before picking this one up. Guy Hancock is a warrior watching over America’s safety--the sort America will never thank. The country’s disowned him, after all, but that doesn’t stop Hancock. He does the dirty work: the kind that involves things so loathsome, a person could lose their soul over it. But he does it for the greater good so when he’s asked to kidnap an innocent woman to stop an evil man, he does it. This evil man is responsible for killing thousands, maybe even tens of thousands. He needs to be eliminated. That is the right thing to do, isn’t it? Everything about Honor Cambridge is about goodness and quiet strength. She’s an aid worker in a dangerous land doing her best to help the innocent victims of war. But when her relief center is bombed by a terrorist group, she must flee for her life because the survival of a mere woman is a blot on the terrorists’ success-rate. Injured, terrified, and now cornered in a village, she’s run through all her options until Hancock shows up. He’s seems to be an answer to her prayers. Surely he’ll see her to safety. Hancock immediately recognizes Honor for who she is and nothing about her makes his job easy. Courageous, bright, and giving are not the qualities he wishes she had because it would be so much easier to sacrifice a repugnant person for the greater good than to sacrifice lovely Honor. So much of this book was trying to catch me up on the past books in the series, I had to dig through reams of information that meant nothing to me. And I know this information was an effort to make DARKEST BEFORE DAWN stand alone, but I didn’t need it. I just wanted Hancock and Honor’s story. That’s it. I don’t care about who or what Hancock was in the previous novels. I just wanted to know who he was now. And yet, I must admit, there were great sections in the novel that moved me as none before. I’m a VERY jaded reader. I don’t cry. I rarely laugh out loud. I’ve read too much. And there’s too much schmaltz out there that makes me roll my eyes so I’m resistant going in. But there I was, heart in my throat, reading a section so heart-breakingly wrenching, I had tears streaming down my face. For the first time in forever. I think it’s safe to say Honor Cambridge is one of the loveliest female characters I’ve ever encountered. And even Hancock was interesting and suitably tortured. That was until the epilogue when he became something quite different and I was left with a bad taste in my mouth. Because who Hancock became, I felt, didn’t revere Honor’s character—the best thing in this book--though he certainly loved her. I don’t know what to tell you. I am still a loyal Banks reader. She has the power to overwhelm me when I’m rarely overwhelmed. And yet I had several issues with DARKEST BEFORE DAWN, not so much that I didn’t stay with it or ignore visiting family members so I could read in peace, but enough that I felt the book fell short of what I expect of this extraordinary writer. I have read most of the books in this series.. And I love them.. They put you through the gamut of emotions.. I agree. Please tell me what you think after you've read the latest. And do you think any of the other novels can stand alone or should they be read as a series beginning with book one? I am terribly disappointed with this series. I really enjoyed the first few books, but then the series took a big nosedive. The subject matter has become grittier and somewhat perverted. The women characters go through degrading circumstances that I have found difficult to read. It's important to me to like the hero, and Hancock is not my idea of an heroic and likeable character. I won't even give this one a try. Thanks for sharing your thoughts, Cheryl. I enjoy Banks' historical romances but I haven't read her romantic suspense. Oh, Cheryl. I haven't read the other books in the series so I can't comment, but I agree with what you said as it relates to DARKEST BEFORE DAWN. And Banks is such a good writer! I don't know what to say. I'm extremely conflicted. Banks is such a good writer that I can't fathom what happened with this book. I'm not turned off, mind you. I'm just in a wait-and-see phase. Because she did make me cry. So many of my friends love her books. They can hardly wait for the next book to come out. Yet I haven't started the series. I really need to start this series. You do. There is not one hesitation in me that would discourage you from such an endeavor. I just don't know what to do with this book.